Rachel Ishikawa: When did art begin for you? Laura Kina: My mom. She had been a double major in art and sociology in undergrad and worked for a time as a technical illustrator for Boeing’s aerospace division. I was born in Riverside, CA, in 1973, and when I was just two years old she turned our enclosed sun porch into an art studio for me, gave me a big paintbrush, a pile of red paint and rolls of butcher paper to go crazy on. I was painting before I could really talk or write. Making art became my initial way of processing the world around me. In 1976 my little sister Alison was born with Down’s Syndrome, so we moved to a little Norwegian town in the Pacific Northwest called Poulsbo, WA to be near my mom’s parents but also so my dad could set up a private practice as a family practitioner and OGBYN [obstetrician-gynecologist]. I learned how to sew from my great grandma, Ethel “Nanny” Smiley. She was a professional seamstress. I spent a lot of time playing in the woods, building forts, drawing, and using my imagination and also doing manual chores (yard work, gardening, canning) that one has to do living in the country. I think that really influenced my inclination toward making things with my hands. This was the late 1970s, and one of my house chores was to rake our ochre yellow shag carpet into this Zen like perfection. That was probably my first contemporary artwork! Seattle, WA was a ferryboat ride away, and my mom would take me on special excursions to the Seattle Art Museum to expose me to the arts. My most impactful early art history lessons involved climbing around on Isamu Noguchi’s 1969 Black Sun sculpture that was in front of the museum, seeing works about the migration of African-Americans from the South to the North in Jacob Lawrence’s Great Migration series, and seeing a lot of Northwest Salish and Tlingit tribal art. When I was in high school, I saw a mural that Roger Shimomura had created in 1988 at the Westlake Metro bus stop that addresses racism against Asian Americans and combines styles from Edo period Japanese ukiyo-e woodblock prints with American mid-century cartoons. I also got to take private art lessons at a little place called Sunshine Studios with Phyllis Oliver all through my middle school and high school years, and she is the one who encouraged me to go to art school. In 1991 I moved to Chicago to attend the School of the Art Institute of Chicago, where I studied with Michiko Itatani and the late Ray Yoshida, earned my B.F.A., and got involved early on with Asian American arts organizations – DestinAsian and the Foundation for Asian American Independent Media. I went to the University of Illinois at Chicago and earned my M.F.A. in 2001. Painters Kerry James Marshall and Phyllis Bramson were my thesis advisors. After that I was involved with the Asian American Artists Collective and began my career as a college professor. My dad is Okinawan from Hawai’i, and it’s a bit unusual for an Asian American parent, especially one that is a doctor, to encourage their child to be an artist. I recently asked him why he didn’t try to discourage me from going into the arts. I really at no time had any doubts that this wasn’t a sensible career choice to be a painter! My dad said that he had dreamed of being a doctor when he was a kid growing up working on a sugar cane plantation but no one around him thought this was realistic and his high school guidance counselor just laughed at the idea. It wasn’t until he was at University Hawai’i, Hilo that his chemistry teacher, Dr. Andy Montana, believed that he could do this and encouraged him to pursue his dream. My dad believed I could get to my goal too. RI: What is your creative process when you approach a new piece? Do you return to certain sources of inspiration? LK: It’s usually a combination of initial inspiration from a biographical impulse, a set of growing questions, or key images that guide the project, field research, and then studio production. Pulling from family and community photographic archives and oral history has been constant in my work, as has an interest in graphic pattern and decoration and figurative work. This series of paintings draws from family album and oral history and community archives from my father’s side of the family. These ghostly oil paintings employ distilled memories to investigate themes of distance, longing, and belonging. These works embrace the power of story telling and personal perspective but also seek to go beyond individual narrative to map my story, and that of my families, against larger histories of migration, colonization, war, and assimilation. Most of the works are set is my father’s Okinawan sugarcane field plantation community, Pi’ihonua, on the Big Island of Hawai’i, near Hilo. The title knowingly plays with the Elvis Blue Hawaii movie notion of seeing Hawai’i as a paradise and tourist location, but it also points to a lingering melancholic state of post-World War II trauma I’m interested in, and my specific obsession with blue was inspired by the indigo-dyed kasuri kimonos repurposed by the Issei [first generation] “picture bride” immigrants for canefield work clothes, and colored by obake ghost stories of hinotama [fireballs] shooting from the canefield cemetery into the night sky. In 2009 I took a trip back to Pi’ihonua to begin my research for this project by talking story with elders in his community. We subsequently travelled back to Okinawa, Japan together to gather more stories and images of history and heritage, and this is when I started looking at the bigger picture of labor and military migration and occupation that connects Hawai’i and Okinawa. 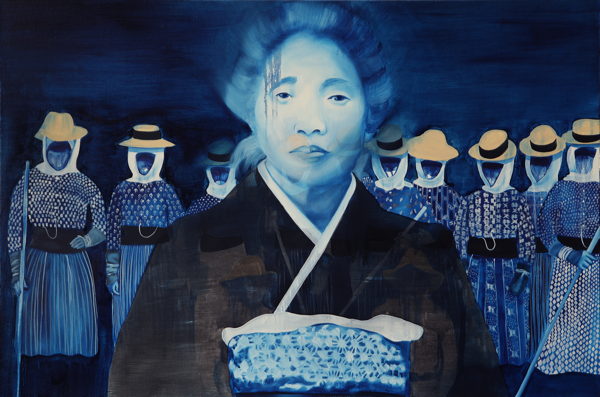 Laura Kina, Issei, 30" x 45", Oil on canvas, 2011. Courtesy of the artist. RI: Many of your pieces have a connection to your identity as a “hapa, yonsei, Uchinanchu.” At the same time they are historically rooted. How does the personal, political, and historical function within your work? LK: Being multiracial (my mother is “white” –Spanish-Basque on her mother’s side and French, English, Scottish, Irish, and Dutch on her father’s side) has been a fundamental experience for me both in terms of how I’m perceived and treated but also in terms of how I understand myself and the world around me. I grew up in a predominantly White and Native American community, and there were not too many other Asians or other mixed kids around so I was hyper aware of being different. On one hand, being multiracial was celebrated as a sign of racial progress and being the “best of both worlds.” We were accepted, but then people would ask, “What are you?” or “Where are you really from?” or say things like “You look so exotic,” which would imply that maybe I didn’t belong. The fact of the matter is that I could be a member of the Daughter’s of the American Revolution. Our relatives were French mercenaries in the American Revolutionary War. I’m related to James Knox Polk, the eleventh president of the US, and to the Confederate Major General George Pickett, who lost the Battle of Gettysburg. Our family, like many Japanese Americans, was on a path towards white assimilation and plodding along the well-worn “model minority” path of working hard, getting good grades and being a good citizen. Don’t cause trouble. Don’t make waves. But my Grandma Kina lived in our house with us when I was growing up, and she was this character that just couldn’t blend in. She spoke Pidgin English, wore bright flowered muumuus, made SPAM musubi, and loved to gossip and laugh and watch soap operas. My little sister Alison, who had Down’s Syndrome, was also profoundly “different.” So I grew up being aware of these tensions of wanting to fit in but always sticking out and then kind of reveling in the freedom of not being like everyone else. As an adult I’ve come to understand that my story is actually not that “exceptional.” My experiences of growing up outside of an ethnic enclave, not speaking Japanese, and being mixed race are very typical generationally for yonsei [fourth generation] Japanese Americans. In Chicago I’ve become actively involved with the Japanese American Service Committee (JASC) and being part of the Japanese American community. Most of that community experience is marked by the internment and post-WWII resettlement, which is not my family’s story. I’m also on a journey to understand what it means to be ethnically Okinawan and part of the Okinawan diaspora in Hawai’i (Uchinanchu) and to actively NOT forget our history. In the case of Okinawa, this is especially crucial because we have been colonized by both mainland Japan and the United States, and much of our history has been erased as a result. As labor migrants we also are part of the history of colonization of Hawai’i (“settler colonialism”). Hapa is the Native Hawaiian term for “part” or “half” as in hapa haole, or half white, that I grew up using. Although it was originally intended to refer to those of partial Native Hawaiian decent the term has been expanded to refer to anyone of partial Asian/Pacific Islander descent. It’s a contested term, and my co-author Wei Ming Dariotis and I examine this history in our book War Baby/Love Child: Mixed Race Asian American Art (University of Washington Press, 2013). So you can see that even in trying to name what I am I can’t separate out these overlapping histories. In both my artwork and academic work I’ve sought to link this personal narrative up with larger sociopolitical and historical frameworks. I’m not that interested, however, in making didactic political work. I love painting and use traditional genres of landscape, portrait, and still life. Even though the “personal, political and historical” are there in my research and front and center in terms of the subject matter, when I get into the studio it’s really about making a good painting and getting lost in color, form, feelings, fantasy, and memory. It’s only after I come back up for air and look and talk about the work that I can usually make the connections back to the historical and political significance. In many ways I see my job as an activist archivist who captures the texture and feelings of history and makes connections to our present moment. RI: Your work featured on CA+T’s Food Worlds exhibition explores the presence of American food in colonized Okinawa. Other states colonized by the United States, like the Philippines and the Marshall Islands, demonstrate similar trends of American food culture. I think your work could resonate with a lot of different people. Is there an intentional motion of solidarity or community building in your work? LK: “Black Market” and “Okinawa-All American Food” are paintings based on snapshots I took on a trip to Okinawa, Japan to visit my extended family. I took the usual tourist photos, but what ended up standing out to me were the shots I took on our way to someplace else – photos of above ground Chinese style graves by the side of the freeway and the power lines, military bases, and green golf shooting range netting interrupting the otherwise scenic landscape. “Okinawa-All American Food” features an A&W restaurant billboard and is indicative of the post-WWII mid-century American junk food culture we’ve left in Okinawa and probably any other place the US military has had an extended presence. “Black Market” was from a day my dad’s cousin, Hideo, stopped by a black market near Kin Town to pick up some American style Folgers coffee on our way to a tourist destination. You can buy vienna sausages, Kool-Aid, and any number of packaged American goods that are resold from the military PX stores. This past November 2013 I was visiting, and we purchased a fruit cake in a back alley at a farmers market in Chatan. I was initially horrified that my cousin actually wanted to eat this. He said he grew up eating fruitcake at Christmas time during the American occupation of Okinawa (1945-1972) and it makes him feel very nostalgic for his childhood. His first memories of drinking milk weren’t as fond! So we got the fruitcake and picked up the taco rice and made a meal of it. I think many of these name-brand American processed food products that we might associate with low brow food culture in the US actually symbolize an entrance into post-WWII economic security for the older generation of Okinawans. I certainly feel this way about SPAM sushi or making mac[aroni] salad loaded with Hellmann’s mayonnaise. Even though my family is Jewish (I married a Jew and converted) and we aren’t supposed to eat pork and it’s not good for you anyway, I just love SPAM sushi. It tastes great, but it also feels like the whole messy colonial history is there in one dish. Today there is a large Filipino Navy community in the Pacific Northwest, and through our family friends I’ve come to enjoy Filipino cuisine and I see many parallels with the use of canned foods in Hawai’i and Okinawa. Even if you could get fresh fruit from your backyard, the canned Del Monte fruit cocktail salad with Nestle cream and condensed milk is just somehow more special! Aside from Asia-Pacific postcolonial food culture that unites places like Hawai’i, Okinawa, the Philippines, Guam, and Samoa, I know there is a more important solidarity at stake in terms of environmental concerns, civilian safety, and reducing the military footprint and occupation in these locations. RI: How does collage function within your work? Is there a connection between this aesthetic and concepts like family history and diaspora that you address? LK: Even if I’m making a straight oil painting, there tends to be a collage aesthetic to my work. Fracturing, overlapping, merging two images from different sources, being OK with disjuncture are both aesthetic and conceptual strategies that mirror my own experience. They are also very much part of the post-modern history of Western painting and reflect our current moment in terms of technology with tools like Photoshop and how creating layers of image and text is just part of our everyday visual landscape. My works often seek to collapse time and space. Collage and bricolage, especially in my textile works, are methods that just seem to work. RI: What are you currently working on? LK: I’m just starting to illustrate a children’s book, Da Pidgin Guerrilla, for Lee A. Tonouchi, an Okinawan poet from Hawai’i who writes in Pidgin English. Art historian and CA+T Operations, New Media, and Curatorial Director Jan Christian Bernabe and I are also working on a scholarly anthology called Que(e)rying Contemporary Asian American Art. I’m also excited to be working on a show with another hapa Uchinanchu, photographer Emily Hanako Momohara. Selections from her Islands series and my Sugar and Blue Hawai’i works will be in a show titled Sugar/Islands: Finding Okinawa in Hawai’i – The art of Laura Kina and Emily Hanako Momohara, curated by Krystal Hauseur, which will open July–September 2015 at the Japanese American National Museum in Los Angeles.